I always thought it was difficult and time consuming but now I know it isn't. Making falafel at home turned out easy and fun. 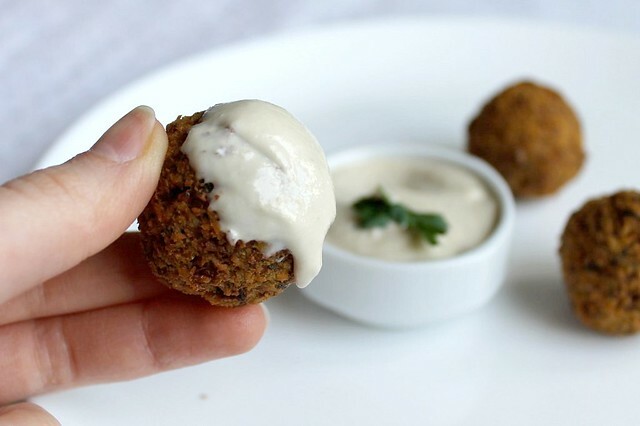 But even if it wasn't I'd still do that at least sometimes because nothing can compare to having that first falafel ball. It is yours right out of the hot oil before anyone even knows that falafel is coming. I mean, you have to taste when you cook, right? Yes, it does require soaking chickpeas overnight. When you make hummus, you can avoid it by buying canned chickpeas, but here you can't. As far as I understand, classic falafel is made of chickpeas which have been soaked but not cooked (boiled). You add no flour and no eggs to it, just grind the chickpeas with spices (cumin, coriander, pepper etc.) and greens (like parsley/mint/cilantro). 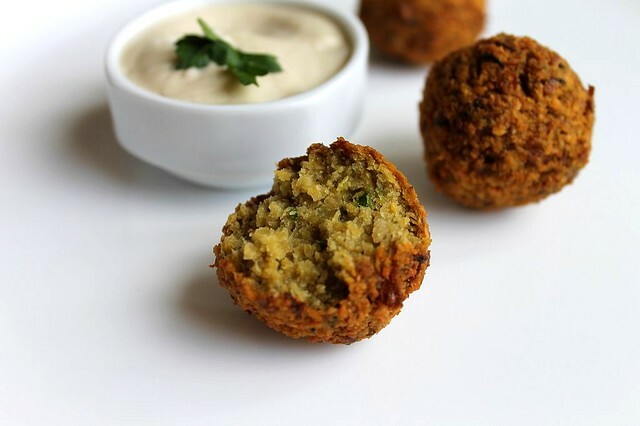 It yields the falafel, which is quite dense but soft inside with firm and crunchy outside. E.g. falafel I had at Ragout cafe was delicious, but it was different. It was very creamy inside, like French mashed potato, so there must be some other technology under it. This time I wanted something close to Lebanese falafel we had in France. Grinding took me the most effort, but that must be because my food processor is far from perfect. Soaking the chickpeas overnight doesn't feel too hard. After I started Middle Eastern and Indian cooking I soak something every other night. Even my family is not surprised any more when they find another something of strange color and shape soaking at the kitchen in the morning. After grinding you shape the chickpea dough into balls with your hands, which I absolutely love. They form easily and perfectly. Then they also deep fry perfectly. If your oil is hot and there is enough of it, you don't even need to get involved after throwing the balls in. No sticking, no falling apart, you can just watch the show. I think it is very much worth it to make the tahini sauce (tarator). 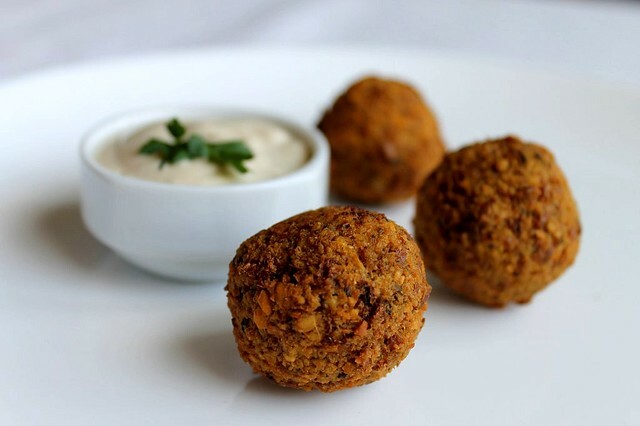 It is creamy, chilling, lemony fresh and complements hot falafel perfectly. It is basically tahini diluted with water and seasoned with lemon juice, salt, garlic and sometimes pepper. Tahini behaves in a very interesting way when you add water to it. It curdles and actually becomes thicker, not thinner. As you keep whisking it becomes creamy - it is worth watching at least once. It has to do with emulsification - two liquids thicken when combined. My dad is into physics and chemistry, he tried to explain this to me in detail. Not that I got it, but I understand that something similar happens when you make mayonnaise. That's my first experiment with Gordon Ramsay's World Kitchen, which I got as a present for March 8th and I have to say I love the book. Both as a recipe source and as a source of inspiration for trying new things. Wash the chickpeas and soak them in lots of room temperature water overnight or even for around 24 hours. I add 1 table spoon of baking soda to the water, because it speeds up the process, but it is not necessary. Drain, rinse and drain well again. Combine the chickpeas and all other ingredients besides oil in a food processor. Process till you get the paste which is almost even and is easy to shape into balls. It will probably still have recognizable little chunks of chickpeas and that's OK. If you want it perfectly smooth, it is better to use meat grinder or other heavy machinery. Taste, adjust the saltiness. Shape the paste into balls, around 2 cm in diameter with a table spoon and/or with your hands. Chill the balls in the fridge for 15-30 minutes. Heat the oil for deep frying. It needs to be at least 2 cm deep. It is hot enough if it sizzles actively once you through a ball in. Fry in small batches till golden brown (around 5 minutes a batch) and transfer to a paper towel. Serve hot with tarator sauce. Combine all ingredients in a small bowl and whisk till the sauce is smooth and creamy. At first tahini will curdle, but as you keep whisking, it will become back creamy. Давно не видел такого красивого фалафеля. Главное - без муки и яиц и панировочных сухарей, как почему-то принято в нашей блогосфере. I've tried making these at home and just haven't managed to get a flavourful result. Also, I found using the soaked but uncooked chickpeas results in too crunchy interior. I think if I were to make it again I would use cooked chickpeas to make the falafel. I see. I can see many people using cooked chickpeas. In this case you might need to add flour and/or eggs to make the dough hold. As far as I understand it is considered not traditional, but it is a matter of taste obviously. The most important thing is to get the falafel you will like!